Prior to completion of the transcontinental railroad, travel from New York to California was a six month journey, by land or by sea. In 1866 Frederick Marriott of San Francisco formed The Aerial Steam Navigation Company with the goal of building and operating large steam-powered airship between New York and California, bridging the gap between the population centers of the United States and the burgeoning gold fields of the Pacific. 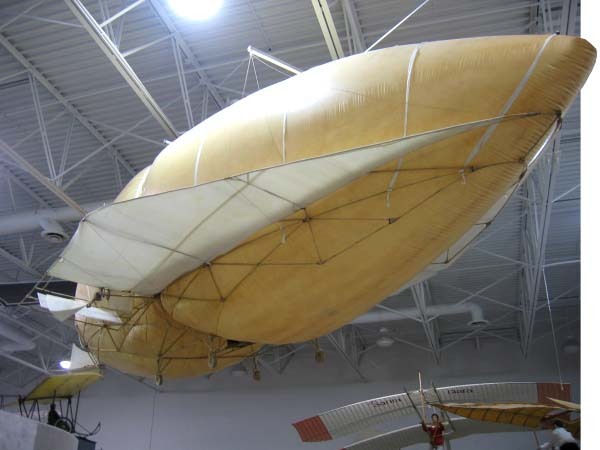 By 1869, Marriott had constructed a 37′ long prototype named the Hermes Jr. Avitor, after the fleet-footed Roman messenger god who flew through the air on winged sandals. The prototype carried no pilot and was powered by a 1-horsepower steam engine. Buoyant lift was provided by a hydrogen-filled envelope, with stabilizers and elevator surfaces attached to allow for controlled flight. The vehicle was successfully tested at Tanforan, near modern-day San Francisco International Airport. The aircraft completed a circular flight of approximately 1 mile and was recovered successfully. Marriott planned construction of a larger version capable of carrying passengers and crew, but completion of the first rail link between east and west coasts in 1869 reduced transcontinental travel times to a week or less, and the stock market crash of 1870 prevented him from securing the necessary financing. The original prototype was destroyed in a fire; the Hiller Aviation Museum displays a full-scale replica at the entrance to its main Gallery.